GARDEN CENTER - ​Come visit us and enjoy a unique and pleasurable garden shopping experience. Our ever changing layout is full of hardy, healthy plants and great gardening ideas. ​GROWER​ - Growing most of our plants has enabled us to offer you healthy, robust plant that are sure to thrive in your gardens. It also allows us to sell them to you at fantastic prices! NATIVE PLANTS​ - We carry the widest selection of native shrubs, perennials and trees in the area. Stop by and see why folks come from miles around to buy our great native plants. 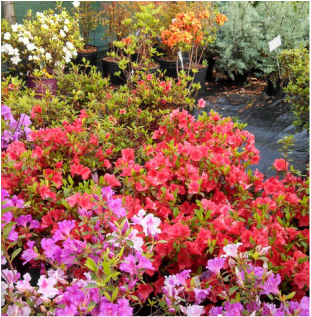 ​Wakefield Valley Nursery is Carroll County's #1 Garden Center for top quality landscaping plants at reasonable prices. Our knowledgeable and courteous sales staff is always eager to help you with all your landscaping needs. Starting in business in 1985, owner Frank Vleck was right out of college and looking to expand the 'corner of the cornfield' that his father let him grow shrubs on while he was in high school. Deciding that he had enough stock to make a go of it, Frank begin his journey into the nursery business by expanding from Mom and Dad's front yard, as a sales yard, to the renovated old dairy farm on the family property. Increasing production to 10 acres of field grown stock allowed the company to incorporate in 1991. Today, we have evolved into a container production nursery selling a wide range of hardy plants to homeowners throughout Central Maryland. 2019 will be our 34th year in business, longer than any other nursery or garden center in Carroll County.